We recently celebrated the 25th anniversary of Johnny Walkers working at Taylors Bulbs. 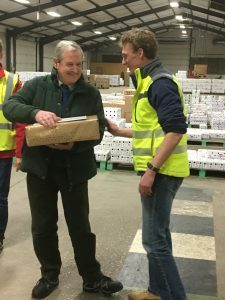 Johnny, known as having the “Midas Touch” for his huge haul of awards at both Chelsea and Harrogate flower shows, has worked for Taylors Bulbs as quality control and goods in manager for 25 years. 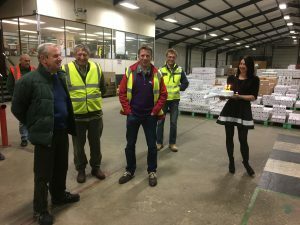 During that time he has racked up 23 consecutive Chelsea Gold Medals and numerous Premier Awards at Harrogate Flower Show for displays of multiple daffodil varieties, many of which are flowering out of season. With preparations for both 2017 shows already well under way, the weight of expectation for further awards continues to build. 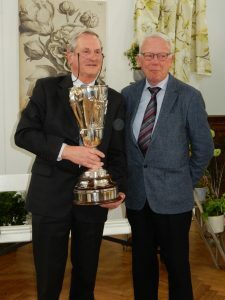 In 2016, Johnny was also awarded the Peter Barr Memorial Cup by the Royal Horticultural Society in recognition of his outstanding work in connection with daffodils. Johnny was pleased to receive a new digital projector as reward for his years of service which he will use for the many bulb presentations he does throughout the year to different organisations and societies, finally replacing his old carousel slide projector!